Our time in Maabaidhoo earlier this week seemed to pass very quickly, just a few fleeting moments backed up with the notes on Dan’s phone and images on Naj’s SD card. Before they get lost with the rest, we’ve added captions to our favourite images (so, back to basics really) so we can share our experience of this little island in the channel. Boarding the packed atoll ferry from Dhanbidhoo, we bumped into a friend from Kalaidhoo, on his way to Gan. Realising where we were heading, he tapped his friend on the shoulder, who made a call and our next island guide was confirmed. Before we’d had time to grab breakfast at the harbour-side cafe, our Humayd had arrive, with a spare bike. Behind him, next to the letters spelling out the island name (really useful btw, cos we’re still struggling with the spelling) was a model dhoni with the words ‘Maabaidhoo Maruhabaa’. These harbour-front welcome signs are not found on every island, but we really think they should be (from memory, the best we’ve seen so far were probably on G.A. 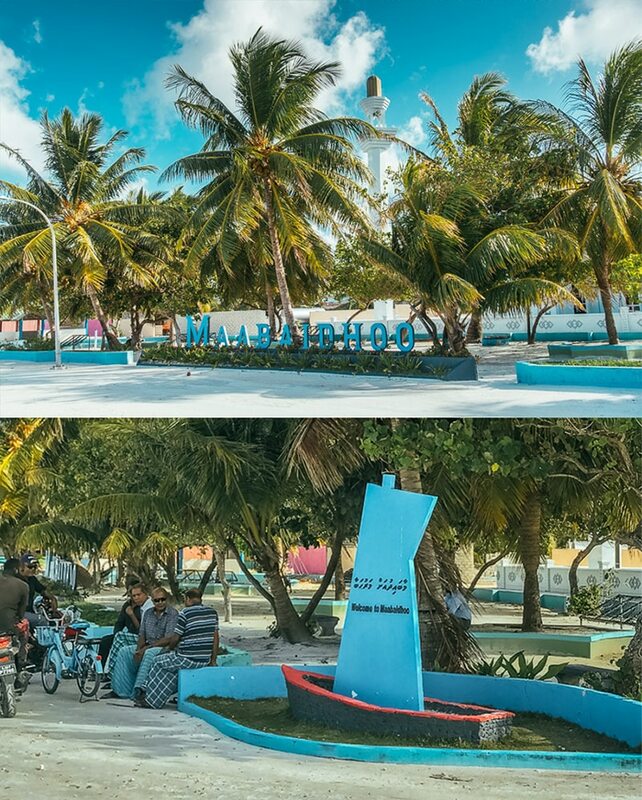 Gemanafushi and Villingili). The northern half of the island is kind of shaped like a crab’s pincer, which is related to the only real piece of information we had about the island (warning: information drop). 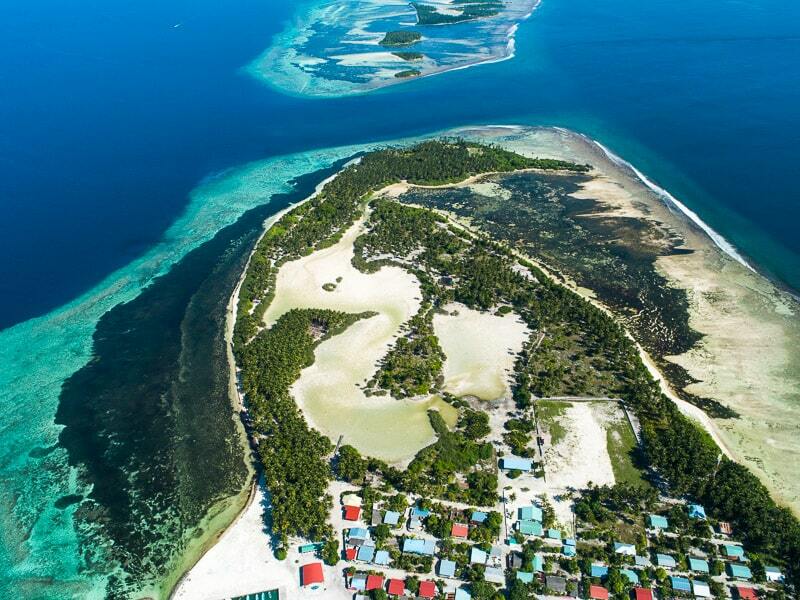 Reports on Maldivian topography (…stay with us) suggest that Maabaidhoo as we ‘know’ it today used to be up to four separate islands, with the others’ names dropped when the ocean married them to Maabaidhoo (and the island isn’t long enough to fit ‘Maabaidhoo-Dhurudhahu-Kerendoo-Kadaage Rah’* on the harbour). This happy union has subsequently been blessed with the arrival of a kulhi and a mangrove system. Water still enters through a narrow channel between the two pincers, where someone has kindly placed a little swing over the water, from which you can watch the island(s) evolve. As well as bringing those crazy kids together, the heavy currents sweeping through the kandu either side of the island have also produced a crop of young surfers on the island…including our man in Maabaidhoo, Humayd. 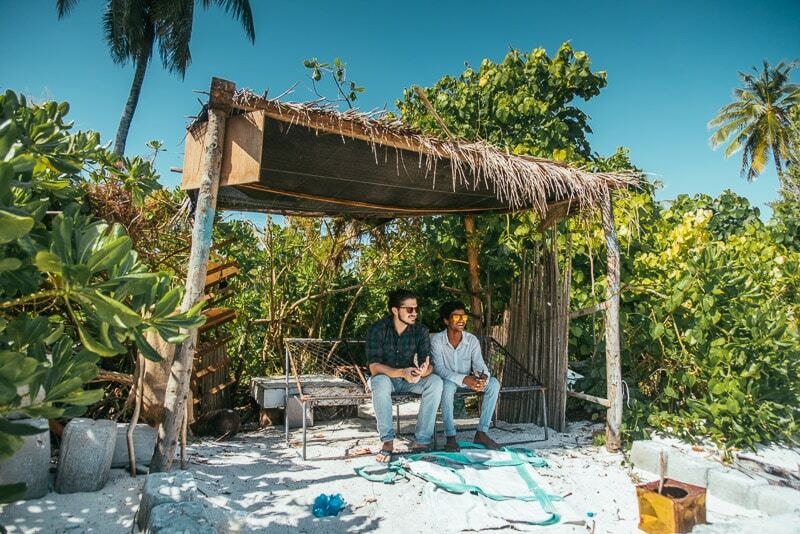 One of the best moments of the day was journeying up the windy pincer-path to the tip of the island, where the surfers have recently constructed their own shack, ready for the big raalhu to hit the reef when the season comes around in a few months. The guys also keep the very first modern board used to surf the local breaks there. Finally, as the sun moves over a bit to make space these islands’ sandy streets, another special moment is normally guaranteed. 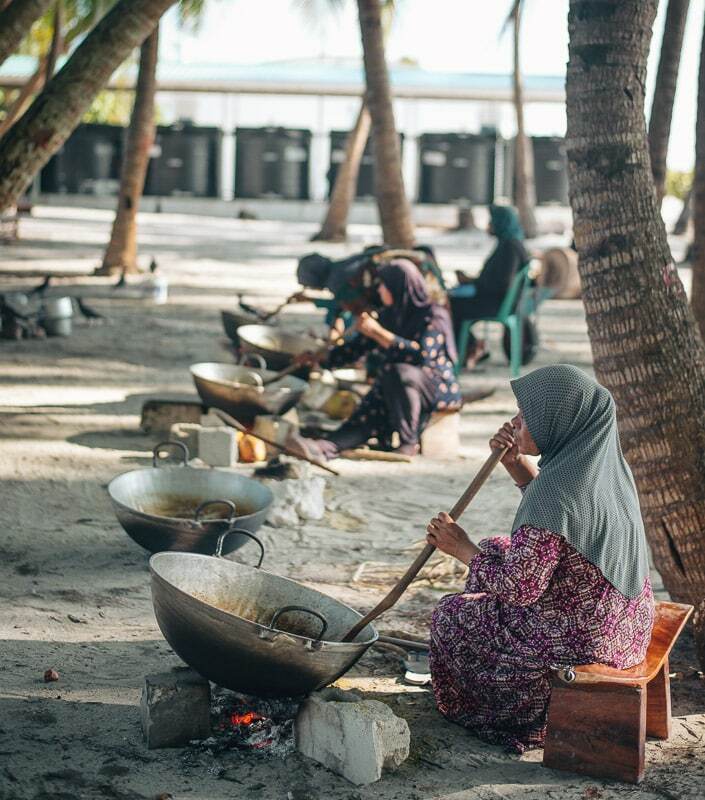 In Maabaidhoo, we found a group of hard-working ladies gently perspiring over a collection of cauldrons, preparing industrial amounts of havaadhu to add a little spice to island life. As they stirred, the occasional bike whizzed past towards the numerous boatbuilding projects further along the beach, while a family-sized holhuashi took the strain for those who still felt the sun was crowding them a little. A perfect moment end to a great day in Maabaidhoo. *Need to double check these names with H.A. Manik’s 1990 work on island topography (which is back in Addu) though Dan’s notes are usually trustworthy.